Knowing a cashless society is a sign the end of this age is near, is there any hope? 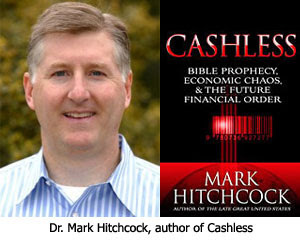 Dr. Hitchcock: I ended my book Cashless with a chapter titled "Cashless and You, Dollars and Cents." I always like at the end of my books to convey one of the main purposes for writing these books — that if someone doesn't know Christ I give them the Gospel of Jesus Christ. For those of us who know the Lord, I also give some practical challenges and admonitions. I end with some hope. If a person doesn't know the Lord, one of the things I talk about in that last chapter is that we can talk all we want to about the coming cashless society, but right now we have a present Christ-less society. For those people who don't know Jesus Christ, accepting His salvation is the ultimate thing they need to do. A beautiful thing is the Lord offers us the Gospel and forgiveness of our sins without any cost — it is a free gift. That great news is the greatest news in all the world! We have a Gospel that is free and doesn't cost us anything. Now, let me be clear — it cost God. It cost Christ His life there on the cross, but it is free to you and me to accept. Just thinking about the whole issue of economics worries people a lot. We end up thinking too much about money. I understand money is important to our lives, and God knows that, but God can take care of us financially if we'll trust in Him. If we will be faithful with what He has given to us, and faithful in giving and sharing and being generous, then we can be assured all our needs will be met by Him. We should never trust in money. There are a whole lot of warnings about trusting money in the Bible. Remember the church of Laodicea thought they were self-sufficient, saying we don't have need of anything, and yet they were so spiritually poor. Money is a great slave, but it is a terrible master. Let's make sure in our lives that while we work hard we do the things that God has called us to do and be good stewards of the money He has entrusted us with. Don't allow money to dominate your life, because Jesus said you can't serve both God and money. When people allow money to dominate their lives and then the economy goes sour, people feel hopeless and so start jumping out of windows and blowing their brains out and hanging themselves. Their hope in money has failed them. Instead, our hope is in Jesus Christ and His coming. What I call the "Sign Posts of Armageddon" are lining up. All of this globalism that we see taking place are those sign posts. The move towards a cashless society is another one of these sign posts. When we see these things happening today, we should be lead to believe that the coming of Jesus Christ will be very near. Such a realization should motivate us to live for Him in these last days in which we live. Difficult economic times create one of the best times to reach people with the Gospel. People are looking for hope because they are desperate. Christians have hope — the Gospel — a word that even means "Good News." Give those people out there hope! Paul was much, much more concerned by false teaching and our being led astray by false teachers. My 88 year old mum say’s to tell you that she has no doubt from Scripture, that any teaching other than Pretrib, is an anathema sent to rob people of the ‘blessed hope’, and to steal away their rewards Jesus has waiting for us. This hurts Him far more than us, as He wants us to benefit from what He so wants us to receive. That is my quick answer, I shall take my time to digest your post and respond as is deemed necessary by me. I know other’s will enjoy ‘speaking’ with you. God bless.